Thanks for linking and visiting my blog!! 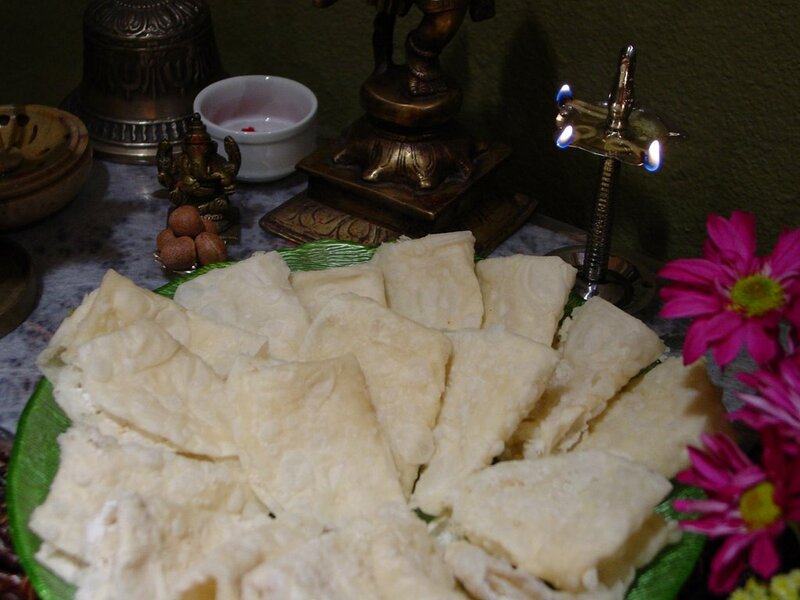 Chevda: we call it Chiroti in Mysore and a must dessert for the weddings. I like them..Thanks.. Lovely post Manisha. And the Chavde look absolutely great. (even I was not sure that I could make them when I tried first time). Thanks for linking me and your kind words. Asha, you're most welcome! Interesting that you call this chiroti in Mysore! 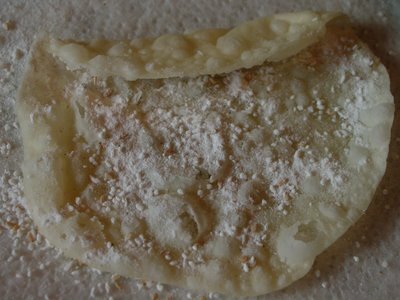 Shilpa made what we call chiroti recently. Shilpa, they're almost all gone. I was hoping I'd be able to share them with my neighbors and save some for a friend who's visiting tomorrow. No such luck! Next time I will have to make more! Shankari, it's yum! The puri gets crunchier if you bind the dough with water instead of milk. But then you have to work even faster! Happy chathurthi and wonderful post...amazing snaps...Ganesha would have been pleased a lot with your offerings!! Indianadoc, thanks and same to you! I'm hoping Ganesh was pleased. The family sure was! We're doing a short aarti every day for 5 days every evening. It gives Medha a chance to dress up in her salwar kameez or chania choli! Oh my !! What a lovely post. And look at the laurels you showered upon me. Humbling... you see I am not that extra-ordinary. I just dicovered your blog in a brief search for slow-cooker recipes (I don't even own one yet). Your blog is wonderful! The food, the photos, and the postings on Colorado, which remind me of my childhood growing up in Montana. I'll have to try the Chavde. I have a picky little Arjun, so any food that sends kids to a state of culinary rapture will have to be tried. 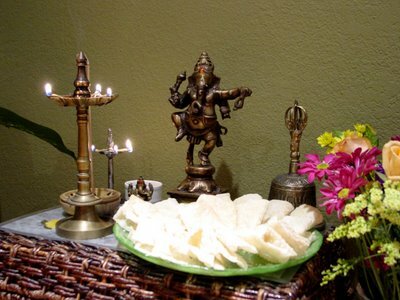 Happy Ganesh chathurthi to you and your family. I could have sworn I had posted a response after simsim's comment but it seems to have disappeared on me! I am now wondering if I posted it to someone else's blog cos I don't even seem to have an email confirmation for it! Yikes! Ashwini, this, too, falls within the category: If I can make it, anyone can. My paternal grandmother was from Kumta and she used to make these. Perhaps the name comes from there? Mythili, that is not for you to say, it is for us to observe! Simsim, thanks and welcome! Montana is gorgeous! You must have had a splendid childhood! I took a long time to buy a slow cooker; now I have two. The large one for meats and soups and the small one for mulled wine. If you're going to make chavde for your son, then I'd like to suggest not including the coconut powder in the filling unless you know that he likes coconut. Let me know how it works out, if you do try them! Vineela, thank you and the same to you and your family! You made a superb spread for the occasion! Wow! Shankari, that was precisely why my husband registered at the drive at the Lemont Temple. They said they had very few Indian donors. He gave a blood sample, I think, and they have his details with them. We received something from them recently so they have our new address, too. I hope something comes up soon for the little girl. I am including her in our prayers every day when we do the aarti. She is adorable and should not have to suffer this way. Hmm lovely. I made modak too ( 21)and will write a post about that as well. deccanheffalump, great to have you here! Ukadiche modak? Wow! Looking forward to the recipe and the significance of the number 21. Wow, these look delicious! Also, I really really want to try your lime pickle. I think we get plenty of sun here in Florida, but I hope it's not too humid. Manisha, i must say you have taken great effort for ganesh chaturthi. I did not do anything this year. Infact ganesh chaturthi was on a weekend and went sight-seeing with my parents who are currently in UK. My mother is going to make modak in a couple of days. thnks for ur concern.i hv try to rectify my mistake.i had no intention to take credit of others. Faith, I had no clue you had a blog! And what a treat it was to read your posts! Thanks for the tag; I'll get to it after Labor Day - I have visitors coming in from California tonight. I hope that is OK! As for the lime pickle, the only thing you will need to worry about it the humidity. Make sure that the jar is air-tight and when you open it up to stir it, make doubly sure that the spoon or spatula you are using to stir is very dry. Shut it as soon as possible to limit exposure to humid air and ensure that it is air-tight again. My sister makes this in Bombay, and her verandah (deck) is right on the ocean. So I think you should be OK! Have a great time with your parents! Nothing is more important than that! Prajakta, thank you for your comment and I am happy that you took my comments in the right spirit. Kudos to you! We all take inspiration from one another; we share recipes and our experiences. 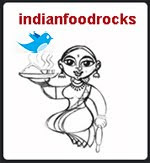 We cook foods that others may have blogged or from books, and display the results on our blogs. However, we give credit to the source, be it a recipe or a photo or an image. Please take the time to acknowledge your sources. I believe you still have some editing left to do. Delicious !! 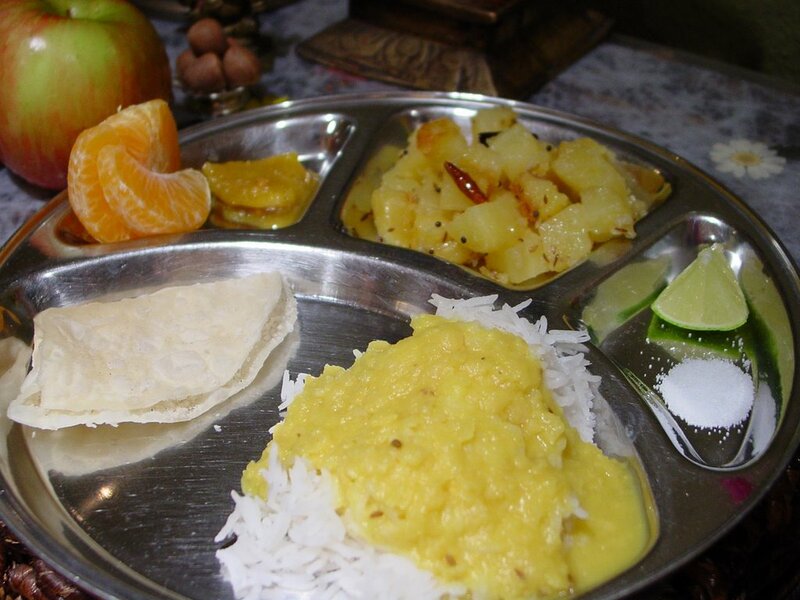 Your thali looks mouth-watering. Love your ganesha idol, lamp and bell. Manisha, thanks! I look forward seeing what you choose - you always put up such great recipes. I will try the lime pickle and be careful of the humidity. I can hardly wait to try homemade lime pickle!! Your blog is excellent for single working guys like me..! Hope to use some more useful recipies in the near future! Keep it up and Bon Appetit! 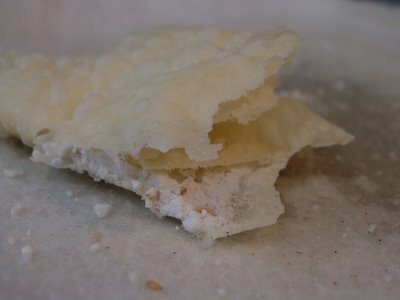 I have a question regarding an Indian dessert I had once in a cultural diversity class in college. It was similar to a rice krispie bar, but with puffed wild rice. It was amazing. I've tried searching on the internet, but cannot locate anything, most likely because I cannot remember the name of it. Any idea? Krithika, that's my special Ganesh murti. I've had it for years now. The lamp dates back to the 1950s - I think. It is a registered design from someone called D.L. Khedekar. The bell is a Buddhist bell that you can get at Bombay Stores (previously called Bombay Swadeshi) near CST (previously VT) in Bombay. I have gifted that bell to many of my friends. It has that authentic temple like sound. And if you get the wooden stick with it and run it around the mouth of the bell, it makes the deep resonating sound of Aum. Faith, for some reason when I take time off work, everyone puts in extra hours and I have a phenomenal backlog to work through! I will get to it this week. Let me know if you try the lime pickle. My visitors loved both my pickles but preferred the lime pickle. They left with a little jar of the lime pickle. I must make more while the sun shines! Saurabh, welcome! I'm thrilled you like the Turkey Kheema recipe. My daughter used to call it Sloppy Joe when she was little. Try the turkey burgers next. They're super simple and can be made in a pan, too. Manju, it was simple yet delicious! Good to know that you are busy! Anonymous, it sounds like it could be kurmura ladoo. 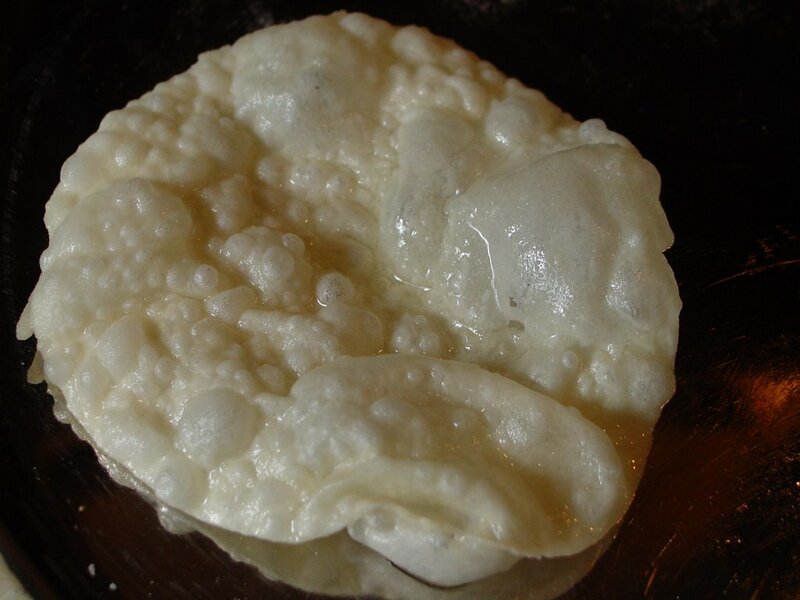 (Kurmura or churmura or mamra is puffed rice). Was it shaped like a bar or was it spherical? It could also be a type of chikki but that is more like a brittle than a rice crispie bar. Let me know if this helps you any! Jen, you're most welcome! 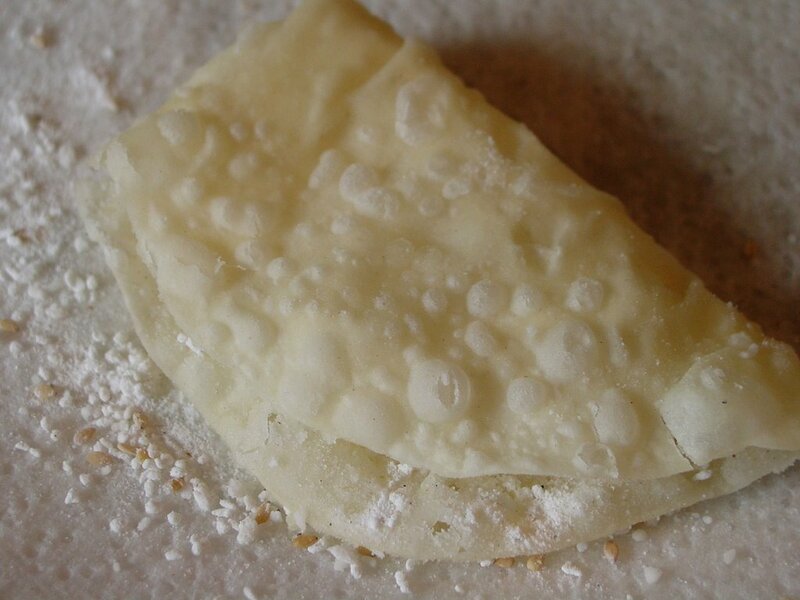 You can press the mixture into a pan and then cut out bars or squares. It would then be called chikki . The ingredients may vary slightly from those in the ladoo. Here's a picture of one such chikki: kurmura chikki. Yash and sushilsingh and ALL of the marketers for desievite - Please stop spamming my blog with your link drops. Your link drops are not welcome. You made chavde! Congratulations, and happy Ganesh Chaturti to you and your family! I am sorry I'm late in seeing this post. I recall eyeing up Shilpa's recipe for these; they look so light and crisp and sweet and I think my potential hard work would disappear quickly! So, til alu with your lime pickle? Good combo to try? I discovered a really good combo recently: had an old friend staying with me recently and he's quite fond of hard-boiled eggs at breakfast. With ketchup, sliced on toast. So...I thought I'd try it with one of my Desi tomato pickles instead of ketchup...wow! 9/11. I visit your blog often, but am ashamed to say, I have not yet left a comment! Love the way you write and have tried out a few recipes too! I tried out the Chavde today, as it is Ganesh Chaturthi. They were good...really good! My normally fussy husband has eaten so many, I've lost count. I followed all your instructions exactly (including setting up the stations)...thank you for being so precise. Finally, I too can say....I made Chavde!